Creating your ideal ceremony to let your love shine. Please be upstanding for the arrival of the bride! I’m here to help you create your dream wedding. Whether it's a fun, personal, heartfelt or more creative style of wedding that you're looking for, I am here to guide you through the process, legal aspects and make planning your special day effortless. The best way to get started is to click 'Contact Me' (below) so you can ask any questions you may have, make special requests and get to know your wedding celebrant in person or over Facetime/ Skype and start this exciting journey. I am forever grateful to my friends who encouraged me to become their celebrant in order to marry them. They recognised with clarity the love and passion I would bring to their special day. Creating your wedding ceremony is such a fun experience and something I take great pride in making sure it is just perfect. You can be sure with my background and experience, that I am organised, thorough and professional. My number one goal: from the moment I meet you, to the big day itself - your ceremony should be fun, stress-free and all about you. If I’m lucky enough to be chosen to officiate your wedding, I'll take care of all the legal aspects of your ceremony and guide you through the process, write up a personal ceremony and lodge all paper work. I will make your love shine and spill over on your wedding day. It is your day and therefore you can create and run it the way you like and no society, religion, great-aunt or celebrant has a role in defining your marriage, because it's yours. Check out my Insta below and get in touch, let's grab a coffee or chat via Skype and start this exciting journey. On behalf of my husband and I we cannot thank Andy enough for his incredible job on our special day! Andy holds such a special place in our hearts from the role he played at our wedding and as a friend. Andy was so unique in his delivery at our ceremony, all our guests were smiling and laughing and genuinely enjoying the whole thing, no more than myself and Blake who loved how personal and loving Andy’s words were throughout the whole speech. From the bottom of our hearts we can't recommend Andy enough! If you want someone to create such a memorable moment for you and keep you smiling the whole time, Andy is your man! Andy is the most amazing celebrant I have ever met. From the outset, he was warm and made us feel comfortable, and helped us have the wedding of our dreams. We approached Andy to give us a Viking themed wedding, and he achieved this with gusto! The ceremony was so unique, and Andy intertwined elements of Viking tradition with modern simplicity to achieve a warm and loving celebration that truly captured the essence of who Chris and I are. The research and effort Andy put in was second to none, even our guests were surprised to find out some of the cute and funny stories of how Chris and I met, and grew together as a couple, which Andy worked into the ceremony in a beautiful and cheeky way (yes, I cried happy tears a little). Everyone who attended gave us amazing feedback, and I would definitely recommend Andy to anyone looking for a personal and beautiful celebrant, and now a lifelong friend. Thank you, Andy for making our special day or that more special. Andy took the time to get to know us and tailored our ceremony around our personalities and our story and crafted a ceremony with the right mix of reverence and fun. The day flew by but we will always remember the time during the ceremony we held hands and Andy’s words led us through a well of emotions making us laugh and cry (happy tears). We could not recommend Andy highly enough. We were lucky enough to see Andy marry our friends months before our wedding, so we knew we would be very happy with him marrying us. He is a great celebrant that involved our guests and made it a light and fun filled ceremony. Would definitely recommend to others....in fact we already have! Andy did an absolutely stellar job as our celebrant last month. He was warm, organised, genuine, friendly and is everything you want in a perfect celebrant! Andy walked us through the entire process step by step to make sure we knew exactly what was going to happen on the day and what he was going to say. He was very happy to make adjustments when we asked. Andy looked fantastic on the day and fitted the relaxed theme just as we hoped. Not to mention very handsome! The ceremony was run so smoothly and very personalised. He has a confident (but not overbearing) voice and demeanour. I also got many compliments about Andy from our guests, that he was so well spoken and created the most loving vibe and atmosphere. Highly recommended and couldn’t be happier with our choice going with Andy!! We all dream of magic in our lives and our intimate harbour side wedding was one of those magical moments. A summer’s morning, the scent of frangipani, the distant sound of lapping waves and birdsong … and then there was Andy. Andy, John and I cannot describe in just a few mere words what you brought to our long awaited day. You allowed us to tailor the service to something that for our friends and family was a true mirror of our 35 year relationship. A joyous blend of emotion, laughter and most importantly love. You have a rare gift that allowed us to feel incredibly relaxed and uplifted, but you also were able to touch everyone around you with a charm and professionalism that was infectious. It’s a simple word, but one that means a lot. John and I wanted to say to you - thank you. Hands down the best ceremony we’ve ever experienced, not just because it was ours (no bias! ), but Andy was a natural and made the whole thing incredibly special, engaging and entertaining. All our friends and family commented, and even our videographer (who we didn’t know! ), that it was one of the best ceremonies they’ve seen. There was so much love in the air and Andy 100% contributed to it. I can’t imagine our special day without Andy as our celebrant. Not only did he meet with us before the wedding, he took the time to ask us questions to tailor a completely person and unique ceremony just for us. He is not your average, run of the mill celebrant - He puts fun and spark into the day, and for me it was my favourite part of the whole wedding as it was so personal and special. I just wish we could rewind and do it all again. Our guests all commented that they had never been to such a fun wedding ceremony, and were really present and enagaged the whole way through. Andy brought his charismatic and uplifting personality from Sydney to Byron to brighten our special day! He was professional, thorough and personable through the whole process. He took the time to get to know us and our story, and customise the ceremony to include romance, humor and tidbits. Andy's passion for life and unstoppable energy shines through his vibrant smile, and it was a true joy to have him alongside us, supporting and guiding us on this very important day. A huge thank-you for all your hard work and effort Andy! We were honoured to have Andy play a part in our special day. He took the time to understand our needs and went the extra mile to personalise our wedding. A natural entertainer, Andy made it fun and inclusive for our family and friends. Thank you Andy for creating such spectacular memories, and being part of the best day of our lives. Andy was a wonderful celebrant from the moment we first asked him to marry us through to the end of the wedding. He took an interest in our story and picked some great moments and anecdotes to share with our guests. He made us feel at ease during the whole ceremony and brought a very special feeling to our special day. Thank you Andy for your professional, well delivered and warm ceremony that could not have happened without you. His bright and positive nature is infectious and from the moment we met we knew he’s the right person for our wedding. We wanted something young, modern and non-traditional and chose a jetty for the ceremony. Andy was great guiding us through the legal bits and pieces and customising the ceremony to our wishes. We bounced ideas around and he created the perfect ceremony we’ll always remember. 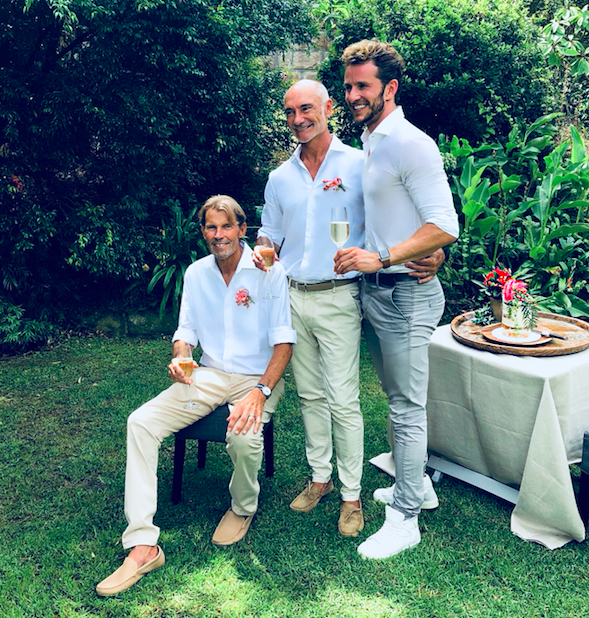 He was everyones darling and even our parents reconsidered getting 'Married again by Andy'… :) He is an amazing celebrant we can only recommend.